Addition of a strong acid to an alcohol leads to the formation of its conjugate acid, called onium or (alkyl)oxonium ion. Alcohols are amphoteric substances which can react with both acids and bases. The amphoteric nature of the hydroxy functional group characterizes the chemical reactivity of alcohols. In strong acids, they exist as alkyloxonium ions, in neutral media as alcohols, and in strong bases as alkoxide ions. As we know, hydroxide as a conjugate base of water is a very bad leaving group. 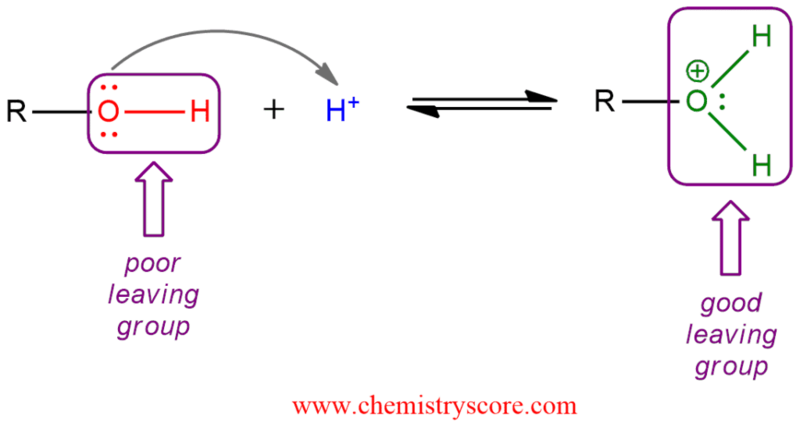 And for alcohols to undergo substitution or elimination reactions the hydroxide must first be converted into a better leaving group. And usually, this is achieved by protonation with a strong acid (hydrohalic acids, sulfuric acid). One of the oxygen lone pairs forms a bond to a proton via an acid-base reaction. This transforms the hydroxide leaving group into the water, a weak base and therefore a good leaving group. Now, this product can participate in reactions such as β elimination and nucleophilic substitution.